MountainGate Country Club Wedding Photographer, L.A. 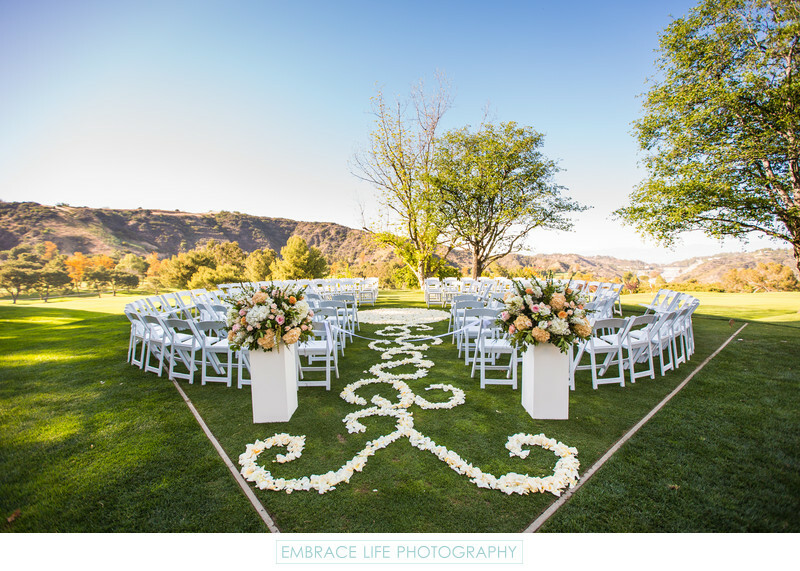 This unique wedding ceremony setup in the shape of a circle at MountainGate Country Club in Los Angeles features a striking flower petal pattern in the aisle, leading to a solid circle of white flower petals at the center, where the bridge and group exchanged the marriage vows. In addition to the creative flower petal designs, Floral Fields also placed two gorgeous arrangements on modern, rectangular, white risers. This Los Angeles wedding venue offers spectacular mountain views, hence its name. Location: 12445 MountainGate Drive, Los Angeles, CA 90049.